THE EXPO FALL NORTH 2018 IS ON! The Icelandic Horse Expo is all about getting together, see amazing horses and learn new things! We started this Expo Fall North by visiting three different farms. Here Guðmar Þór Pétursson trains his horses. He is Icelandic but has been living in the US for about 10 years before he bought the farm Hestaland in 2009. When he returned from the US he still traveled quite a lot and he was also the main person behind the popular horse shows at Fakasel. He acted together with the group at Fakasel in more than 500 shows and did first start to concentrate about the running of Hestaland in 2013. Now Guðmar is training horses and what he uses a lot in the training is the things he learned during his time in the US about western riding. This he combines the classical riding. During our visit at Hestaland Guðmar showed us how he trains with his own breed Ástarpungur frá Staðarhúsum, a 6 years old son of Orri. At farm number two we got a great chicken soup for lunch in the living room. At Syðra-Skörðugili Elvar Einarsson and his wife Fjóla Viktorsdóttir live. You have probably heard about Nökkvi frá Syðra-Skörðugili, a son of Aðall frá Nýjabæ? This year the won the B-flokkur at Landsmót with 9,09 with Jakob Svavar Sigurðsson in the saddle. Not only Eylert but the entire family is in this horse business together. They live from training and selling horses but also from taking tourists on riding tours. The daughter Asdis is working on the farm and the daugther Viktoria is right now at Holar. At Saurbæ Heiðrún Ósk Eymundsdóttir and Pétur Örn Sveinsson live. This farm is also the place where Heiðrún’s brother - the well known rider Toti - was born. Heiðrún and Pétur bought the farm from the parents a few years ago. Toti’s breeding is partly here but his stable is in Saudarkrokur. We got to see a really promising horse in the stable: Naskur frá Saurbæ. He is in training at the moment. 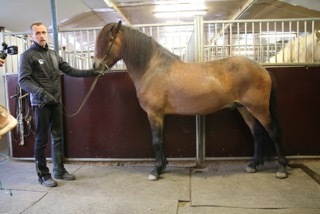 He is a four year old stallion after Narri. Naskur has already been judged for confirmation with 8,44. 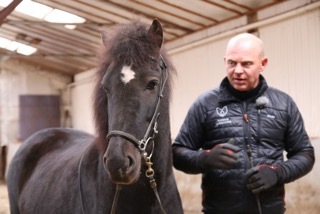 Furthermore Pétur showed us how they start with a young horse through natural horsemanship. This method he also taught the students at Holar when he was teaching there. This was a great first day at the Expo - and we are looking forward to see more beautiful horses and Icelandic nature tomorrow! Stay tuned!